Saint Leo Abbey Mass, Prayer Times, & More! Come to historic Saint Leo Abbey Church in Saint Leo, Florida, to celebrate Mass with the Benedictine monks. You will hear beautiful Gregorian chants, the abbey’s remarkable Royal Classic III organ, and renew your soul with the body and blood of Jesus Christ. Like the Benedictine monks of more than 1000 years ago, the Saint Leo Abbey monks welcome all spiritual pilgrims. On Tuesday, April 16, there will not be a 12:00 pm Mass. The monks will be traveling to the Cathedral of St. Jude to celebrate the Chrism Mass with the Diocese of St. Petersburg at 11:30 am. All are welcome to attend the Chrism Mass at St. Jude Cathedral. Holy Thursday, April 18, Mass of the Lord's Supper: 7:00 pm, followed by Eucharistic Adoration throughout the night. Good Friday, April 19, Liturgy of the Lord's Passion: 3:00 pm. Holy Saturday, April 20, Easter Vigil, First Mass of the Resurrection: 8:30 pm. - There will not be a Mass on Easter Sunday morning since the monks will celebrate the Easter Vigil Mass on Holy Saturday. "Pilate therefore went forth again and saith to them: Behold, I bring him forth unto you, that you may know that I find no cause in him. (Jesus therefore came forth, bearing the crown of thorns and the purple garment.) And he saith to them: Behold the Man. When the chief priests, therefore, and the servants had seen him, they cried out, saying: Crucify him, Crucify him. Pilate saith to them: Take him you, and crucify him: for I find no cause in him. The Jews answered him: We have a law; and according to the law he ought to die, because he made himself the Son of God." The irony Saint John the Apostle often includes in his Gospel is shown in this passage too. "Behold the Man" is true, but masks the ultimate truth of who is there on the balcony and why the Jews want him killed: behold your King, the son of God. By Antonio Ciseri (1821 – 1891) Swiss-Italian. Most of his work is of Bible or religious themes. 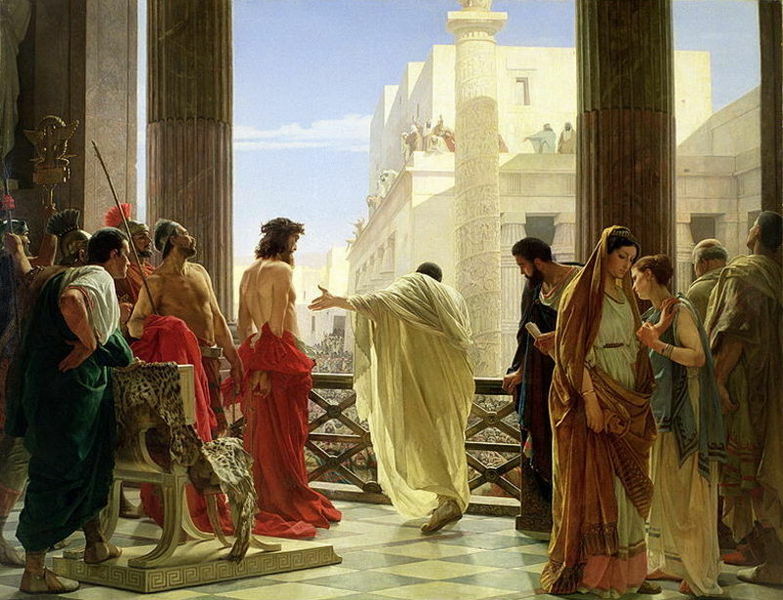 In his painting, Pilate displays Jesus to the angry crowd. Pilate's wife turns away and cautions another woman as if to say, "This is nothing to be looked at. Do not become involved. He is the righteous one, not us." Pilate's wife had earlier warned him, ‘Have nothing to do with that righteous man. I suffered much in a dream today because of him.’” (Matthew 27:19). Tradition including Origen (one of the Greek Fathers of the Church) says that she was converted and became one of the earliest followers of Jesus Christ. The painting also shows Pilate's secretary, aids, and palace guards. "One of the more famous modern versions of the Ecce Homo [Behold the Man] motif was that by the Polish artist Adam Chmielowski, who went on to found, as Brother Albert, the Albertine Brothers (CSAPU) and, a year later, the Albertine Sisters (CSAPI). "Adam Chmielowski was proclaimed a saint on 12 November 1989 by Pope John Paul II. 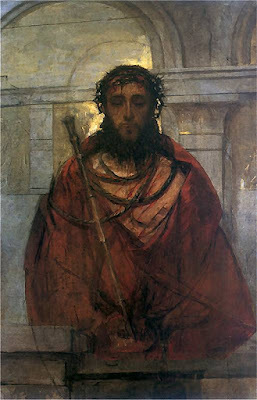 "Chmielowski's Ecce Homo painted between 1879 and 1881), was significant in Chmielowski's life, as it is in Act 1 of Wojtyla's play. "Pope John Paul II is said to have kept a copy of this painting in his apartment at the Vatican. Below are the dates for the Easter Triduum celebrations that all are invited to participate in at the Abbey Church. 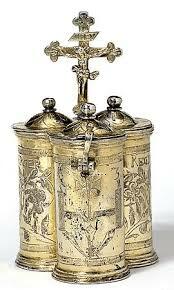 Holy Thursday - April 18, Mass at 7:00 pm. Eucharistic Adoration follows throughout the night. * No 10:00 am Mass on Easter Sunday since the monks will celebrate the Vigil Mass. Tomorrow the monks will celebrate the Solemnity of the Annunciation of the Lord. Mass will be at 10:00 am. There will not be a 12:00 pm Mass. Everyone is invited and welcome. Please join the monks for this Solemnity. Saturday morning, March 23, there will not be a 7:30 am morning Mass after Morning Prayer. The monks will be celebrating Mass at 10:00 am at Holy Name Monastery for the funeral of Sr. Helen Lange, O.S.B.